Spring is here, and that means it’s time to get outside and enjoy the warm weather. We’ve rounded up some of the best local events that are dog-friendly, so you and your furry pal can make the most of the season. Your pup doesn’t have to miss out on all the Easter fun! Celebrate with a traditional egg hunt, and get your picture with the Easter bunny. If you’re hungry, Flash Crab’s food truck will be there with tasty food to purchase. The event is hosted by the Baltimore Humane Society. April 27 at 9-4 p.m. and April 28 11-4 p.m.
Give your dog the time of their life as they get to participate in a day full of fun designed just for them! Events include lure chasing, pie eating, the Fast Fetch Cup and Qualifier, and the Helio ball drop. There is also a costume contest and canine photobooth. Owners will have plenty to do as well — the event includes seminars to help you learn how to be an even better dog owner. Going for a run is a great way for both dogs and their owners to stay in shape. Bringing your pup on a run has a unique set of challenges to overcome, but with a few tips, you and your furry friend will be up and running in no time! Before you start running with your dog, take them to have a check-up with your vet. Let them know you plan on starting to exercise your dog more, so they can pay extra attention to your pet’s heart, lungs and joints. This ensures you don’t do more harm than good by encouraging your pet to run if they aren’t physically fit enough. Just like humans, dogs need time to build up their stamina and energy, so beginning your new routine with a ten mile run isn’t a good idea. Start slowly with short distances, and alternate between running and walking. Dogs’ paws are also sensitive, and need to grow tougher gradually as you increase the distance. Give the leash gentle tugs to keep your dog focused on moving forward and not constantly stopping to pee or sniff something. You want them running at your side within a few feet of you, and a three-to six-foot leash is usually the right length for running with a dog. Reinforce good behavior with a small treat. Puppies’ joints are more prone to injury, so they shouldn’t be taken on long runs until their bones have stopped growing, about 9 months in small dogs and up to 16 months for larger dogs. Until then, keep them fit by going on short walks and playing in the backyard or dog park. While you may have sturdy shoes to run in, your dog doesn’t. Pay attention to the type of surface you’re leading your dog over. During hot months, blacktop and concrete heat up quickly, while jagged ice in the winter can also pose a threat. Keep an eye out for glass and other roadside debris. Inspect your dog’s paws for any cuts before and after your workout, and wipe down their paws with a warm, soapy rag afterward to clean out salt, dirt and any other irritants. For both you and your dog, be sure you drink enough water! Hydrate before and after the run, and if it’s going to be a longer distance it’s important to bring water with you. When your pup gets thirsty, they’ll likely try to drink from puddles and other sources of standing water. Don’t let your dog do this, as they’re often contaminated and can make your dog sick. Your dog can’t speak up when they don’t feel good, but you can still listen to them. Signs that your dog needs a break include foaming at the mouth, heavy panting, glazed eyes and slowing down. If your dog starts to limp or lick the pads of its paw, you should stop the run immediately and return home. If your dog doesn’t seem to be cooling down, place ice bags or cool cloths in their “arm pits” where their legs connect to the rest of their body, and take them to the vet or an emergency clinic, as they might be overheating. The number one thing you need on a run is doggy bags! Just because you’re moving faster than your normal walk doesn’t mean you don’t need to pick up after your dog. If you’re running longer distances, a collapsible bowl to pour water into can be a good investment. There are a variety of hands-free leashes that clip around your waist, so you don’t have to worry about holding onto the leash. Winter brings below-freezing temperatures and icy or snowy conditions, and for stray cats this can pose a potentially deadly problem. Cats’ fur can only keep them so warm, but there are plenty of ways you can help. If you’ve seen a stray cat hanging out in your neighborhood, don’t assume it is able to take care of itself or that someone else will help it. There are a few simple steps you can take to help these animals. Leaving out food and water for cats is helpful for several reasons. Besides the obvious of keeping the cats fed, it also keeps them from consuming scavenged food or water that might make them sick. It also means they don’t have to roam as far looking for food, which can lead to them getting hurt by a cars, predators or other dangers. Wet food requires less energy to digest, leaving more energy to keep warm, but it is also in danger of freezing. Serve it in a plastic bowl and warm up the food before putting it out to help prevent this. If it keeps freezing, switching to dry food is always better than nothing. If you put food out at the same time each day, you create a schedule that the cats can come to expect, meaning that both the food and the animals spend less time in the cold. To keep water from freezing, use bowls that are deep rather than wide, and place it in sunlight. Avoid using a metal bowl, and adding a pinch of sugar lowers the freezing point of water, ensuring it stays liquid longer. To take extra caution, you can spray insulation foam into the underside of plastic feeding dishes and water bowls. Another solution is to place a microwaveable heating pad under the bowls, and you can even make your own heating pad using a sock filled with rice. Creating a shelter doesn’t need to be expensive or time consuming. A few modifications to something as simple as a heavy cardboard box make a perfect place for cats to sleep. Raise the bottom of the box a couple inches above the ground so it doesn’t get soggy, and cover the top with plastic, such as a garbage bag, to protect from the elements. Cutting a hole in a plastic storage bin is also an easy way to create a shelter. Generally, a good size is about two feet by three feet, and 18 inches tall. Smaller spaces keep the heat close and allow the cats to lay next to and on top of each other to share heat. The door should only be large enough for a cat, about six to eight inches. Adding a flap is a good way to keep out ice and rain and keep in heat. Straw is by far the best choice for bedding in a shelter. Blankets, towels and even hay will absorb moisture and then potentially freeze, providing no help at all. Straw will help insulate the cats while staying dry. Be sure to shovel snow away from the entrance so it doesn’t pile up too high and prevent the cat from entering or exiting. There are a few things you can do around your house to help keep stray cats safe. One is to check under your car before starting it and driving away. Animals are often drawn to the heat emanating from the car, and may be curled up underneath to stay warm. Don’t use antifreeze in areas that are accessible to cats, as consuming it can be lethal. Similarly, be sure to use a pet friendly ice melt to melt snow. Possibly the best thing you can do for the feral cats in your area is something often referred to as TNR: trap, neuter, release. Trapping cats and giving them to an animal shelter may just add to an already overcrowded shelter, and, depending on where you live, may just lead them to be euthanized. Neutering or spaying the cats and then releasing them allows them to continue to live as they like, while also limiting the population. Spaying and neutering also improves cats’ overall health. Contact your local shelter for more information on how best to do this in your area. The start of the New Year is often a time when we, as humans, decide to make a change in our lives and set higher goals. But making resolutions isn’t just for us! There are lots of little ways you can decide to improve your pet’s life this year by changing some habits. Just like us, what pets eat can affect their quality of life. This year, you can help keep them healthy by incorporating new habits into your routine. Measuring their food, instead of eyeballing it, every time you feed them ensures they’re not overeating. You can also make a goal to stop feeding your pet table scraps. Their dog food is specially formulated to give them the nutrients they need and the appropriate amount of calories. 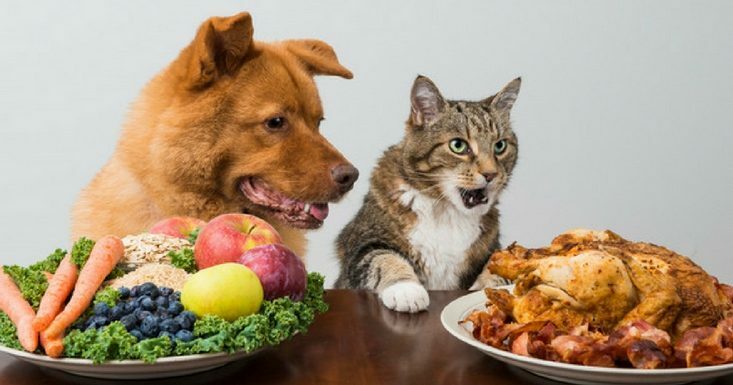 Feeding them leftovers can cause them to gain weight and possibly suffer from gastrointestinal issues. The type and frequency of grooming that your pet needs will depend on their breed and type of coat, but there’s no time like the present to figure out what works best for your furry friend. Brushing your pet removes excess fur, which means there’s less getting on your furniture and clothes. It also helps spread oils from the skin to the fur, causing the coat to look shiny and healthy. Part of your routine should include oral hygiene. Brushing your dog or cat’s teeth prevents tartar and plaque, and helps fight bad breath. Regular appointments with a professional groomer are a great way to easily maintain your pet’s good looks and hygiene. Within the span of a year, a lot can change such as addresses, phone numbers and more information that is key to making sure your pet gets returned to you if they’re lost. In too many cases, people only realize the info on their pet’s tag is out of date after they’ve escaped. If any of your contact information has changed within the past year, be sure to update their tags and microchip as soon as possible. Your pet doesn’t need to be young or disruptive to attend a training class. These classes offer a challenge to dogs to keep them stimulated and also encourages bonding between pet and owner. Even if you don’t want to go to an official class, there are plenty of resources online you can find to help you teach your dog a new trick at home. Learning new tricks and practicing old ones help keep your dog’s brain healthy and engaged. Yearly examinations for your pet are an important part of a good healthcare routine. If you haven’t already, schedule an appointment for your pet to make sure they are healthy. Regular check-ups can catch conditions like diabetes, arthritis and obesity in much earlier stages, which makes them easier to treat and manage. Similarly, be sure to stay on top of preventatives like monthly flea, tick and heartworm medicines. It may seem like a big cost up front, but it’s sure to save you money in the long run by not having to pay for these problems after they arise. When was the last time you cleaned your pet’s food and water bowl? Or their bedding? Their eating dishes should be washed weekly with hot, soapy water. Any bedding they use should be washed weekly as well and if they frequently use a crate or carrier, it should be cleaned using pet-safe products. All of these prevent the build-up of disease-causing bacteria and keep your pet (and you!) healthy. Just like the holidays are a common time for humans to send cards with family updates, the New Year can be a great time to do the same with your pet. If you adopted them from a shelter or a rescue group, take a moment to snap a photo and send them an update so they know how their old friend is doing. We know that the volunteers will be thrilled to know how much your pet loves their forever home! Most of us are aware of the dangers that hot weather holds for pets, but you may not realize the dangers that cold weather can pose. While it is tempting to think that your pet’s fur coat makes them more resilient to cold weather, they are still susceptible to things like frostbite and hypothermia. There are several simple steps you can take to keep your pet safe, no matter the temperature outside. The most important thing is to know your pet’s limits. Animals that are young, old, ill or arthritic are more susceptible to the cold. Other factors like your pet’s coat, stores of body fat, activity level and health will play into how quickly the cold affects them. To help keep your dog active and still safe during the cold weather, dressing them in a sweater or coat and putting booties on their feet will help them stay warm and keep their paws dry. It’s best to have several sweaters on hand so that you always have a dry one to use — putting your pet in a wet sweater is worse than no sweater at all. If your pet won’t wear booties, you should check their paws frequently for cold-weather injuries like cracks or bleeding. Rubbing paw protection wax onto their pads can help keep them protected, both from these injuries and from salt and other deicers. Clip the hair between your dog’s toes to prevent ice from accumulating, which can cause sudden lameness on a walk. When you return from the walk, be sure to wash off their paws to remove ice, antifreeze, deicers or other chemicals they may have picked up. These chemicals are toxic to dogs and may be ingested if the dog licks their paws. Even when your pet is indoors, take extra care during the cold weather. Give several options of places to sleep so they can choose where they feel warmest, and make sure their bed isn’t in a drafty area. Use space heaters with extreme caution when pets are around, as they can burn themselves or even knock the heaters over, potentially starting a fire. The dry air plus fluctuation in temperatures between going outdoors and coming inside may cause your pet’s skin to become itchy and flaky. Keep your home humidified and towel dry your pet as soon as they come in, taking extra care to remove any build-up of snow between their foot pads. Bathe your pet as little as possible during the winter months. Washing them too often strips their skin of helpful oils and can increase the chance of dry skin. Ask your vet or groomer about a moisturizing shampoo to help prevent this. Cars can present dangers of different kinds. Just like when it’s hot outside, you should never leave your dog unattended in a car when the temperature drops. Your car can quickly become like a refrigerator, rapidly dropping your pet’s body temperature to dangerous levels. For stray pets, they may be attracted to the heat coming off your car even when it’s off. Before you get into your car, be sure to check underneath it or make a loud noise to encourage any animals to come out from under the car and find a safer spot to rest. If your pet is whining, shivering, seems anxious, lethargic, weak or begins looking for places to burrow, they could be suffering from hypothermia and should be brought inside to a warm place immediately. Cover your pet with warm water bottles, blankets or towels. Heating pads can burn your pet, so be sure to always have several layers between your pet and a heat source. Frostbite is harder to detect, but if you suspect your pet has either, call your vet immediately and take your animal to receive medical help as soon as possible. It’s the most wonderful time of the year for us humans, but when some of our favorite holiday decorations and traditions can be dangerous or even deadly for pets, it’s important to be vigilant about ways in which you can keep your dog or cat safe. 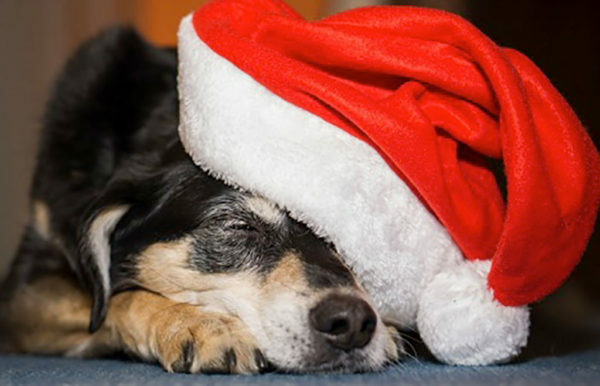 To help, we’ve got a handy holiday survival guide so your Christmas festivities don’t include an emergency trip to the vet! Be sure to anchor your tree securely so it doesn’t fall on your pet (or your family!). If you’re buying a live tree, don’t allow your pet to drink the water in the tree stand. Additives like fertilizer, sugar, aspirin and others can be toxic for pets, and the stagnant water is a breeding ground for bacteria that can cause your pet to get sick. Pine needles can also injure your animal’s digestive tract if consumed, so be sure to vacuum the area around your tree regularly. Stay away from edible decorations like popcorn chains or cookie ornaments, as these will likely prove too enticing for your pet to ignore. When you’re not around, unplug the lights, as many dogs and cats like to chew on these wires, and, if turned on, this can cause burns or even electric shocks. To help prevent ornaments from breaking, set up your Christmas tree but wait to decorate it for a few days. This will help your pet adjust to the strange new object in the house, so, hopefully, by the time you add ornaments their curiosity will have worn off. If you have a particularly determined cat, place aluminum foil on the floor around the tree to give you warning of a potential disaster. Other holiday decorations can be harmful for your pet as well. Tinsel can add some shimmer to your holidays, but if ingested by a pet it will often lead to a blockage in the digestive tract, which often requires surgical intervention. Plants like mistletoe, holly and poinsettias are toxic for pets to consume. Keep these well out of reach, or consider buying artificial alternatives to be on the safe side. Candles, whether they’re holiday-scented or atop a menorah, require extra supervision with pets around. Never leave them unattended and always place them far out of reach of any curious paws or wagging tails. This will prevent your pet from being burned, or even causing a fire. If you have guests coming over for the holidays or if you’re traveling yourself, it’s important to ensure your pet stays safe and comfortable. If you’re playing host to guests, be sure your furry friend has a quiet place to retreat to if they get overwhelmed. Make sure your pet has updated information on their collar or microchip and that they’re wearing the collar at all times, since the opportunities for them to escape increase with extra people coming and going. If any guests ask to bring pets of their own that you don’t already know will get along with your pet, either respectfully decline or arrange to spend some time together before the holidays allowing your pets to get to know each other. If you’re traveling, be sure to know how to keep your pet safe and cared for, whether you’re bringing them on a road trip or on an airplane. If you don’t want to travel with your pet or want to make sure they’re out of harm’s way when you have people over, bringing them to a safe and secure boarding facility is a great way to make sure they stay safe, have fun and save you from stress. If the unexpected and unthinkable happens, make sure you’re prepared to get your pet the help they need. Talk to your vet ahead of time to know where you will need to take your pet in case of an emergency, and know your travel route to get there so you’re not trying to navigate while stressed. It’s important to have your vet’s clinic phone number, a 24/7 emergency vet number (if different), and the ASPCA Poison Control Hotline (1-888-426-4435, a fee may apply) handy in case you need them.